Crowley supplies heating oil, propane, lubricants and accessories to residents and commercial businesses year round in Delta Junction and the Tanana River Valley. 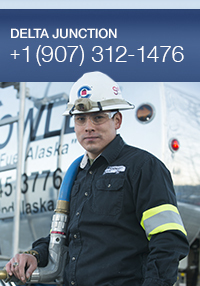 Crowley also offers bulk propane and tank re-fill on site as well as bulk delivery and drummed aviation fuels. Alaskans know Crowley for quality, reliability and competitive prices. Be sure to ask about our auto-fill services and save. Crowley maintains 100,000 gallon refined product bulk storage/loading facility and 18,000 gallon propane bulk storage facility serving the Delta Junction delivery region, the Central Richardson Hwy., from Glennallen and Fairbanks, the Eastern Denali Highway and the Alaska Highway corridor from Delta to the Canadian Border.